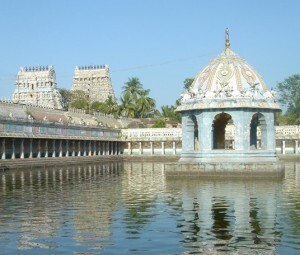 Vaitheeswaran Koil is situated 24 km from Chidambaram and 6 km from south of Sirkazhi. It has a large and important Shiva Temple. A large number of women visit this place to dispossess themselves of devils and pray for their marriage. Vaitheeswaran is the healer of all diseases. It is believed that a bath in the holy water of the Siddhamirtham tank (Holy Tank) situated within the temple complex, cures all ailments. Tourist can visit this place by train and road. This entry was posted in Tamil Nadu, Vaitheeswaran Koil and tagged Holy Place. Bookmark the permalink.